The Children’s House is a nursery class for children from two to four and a half years old. You can register your child as soon after birth as you would like – ready for a start date from two years old – following two introductory mornings. Admissions are taken on a first-come first-served basis. Children remain in the Children’s House class until the July after their fourth birthday, when they gradually transition into Grantham Farm or move on to another school. To visit the Children’s House, please contact us. The Children’s House is calm. It is an accessible room in which children self-resource their ‘work’ activity, develop the ability to concentrate, and once completed return their activity to the shelves ready for the next child to use. In the words of the Ofsted inspector: ‘Tranquillity prevails!’ (Ofsted 2018). Children can work individually, or in groups, with hands-on activities which are made from natural materials, and designed to support each child’s physical, social and intellectual growth. There is a great sense of community between children and adults that belies the young age of the learners. High teacher/child ratios of 1:4 for children of two–three years old and 1:6 for children 3 and 4 years old, means teachers are able to spend time with each child. 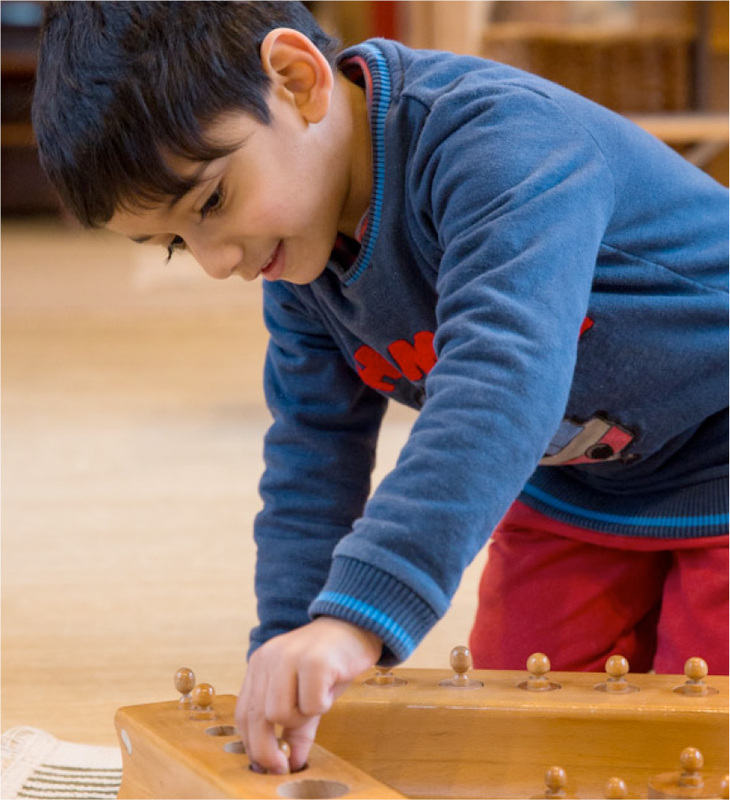 The Children’s House provides a nurturing and empowering experience for young learners; allowing them to develop at their own pace under the guidance of a Montessori teacher. There are also infinite opportunities for exploration of the natural world in our beautiful grounds and surrounding woodland. Children are encouraged toward an appreciation of the expressive arts through music and drama. We have an active sports programme including mini-multi-sport professionally taught by a children’s sports coach. Children also learn French, yoga & mindfulness. When children first start at the Children’s House, settling in is done at a pace that works for the child and for parents/guardians. Our team is highly skilled at helping new children and parents/guardians settle and we will guide you every step of the way. Communication is key.